We are engaged in offering our clients Semi Automatic Paper Cutting Machine. 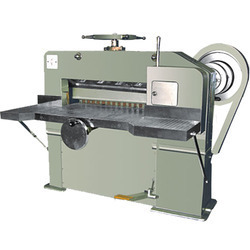 These machines are manufactured using high quality raw materials and good craftsmanship. 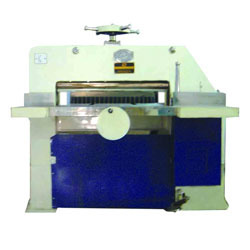 Our Semi Automatic machine is noiseless in function and has automatic self clamping. This machine is suitable for A4, A3 Size Semi Automatic Paper Sheet Cutting Machine, paperboard, plain rainbow paper, the positioning laser transfer paper, white paper, plastic sheet and roll materials. With the help of professionals, we are competent to offer to our clientele an extensive range of Semi Automatic Paper Cutting Machine. Features: Auto clutch, auto daab and auto measure. It has a security sensor. Owing to our enriched industrial experiences, we are committed towards providing a wide variety of excellent quality Semi Automatic Paper Cutting Machine. As one of the reputed manufacturers, exporters and suppliers we are offering the latest technological Semi Automatic Paper Cutting Machines. These are built with the electromagnetic brake and clutch for safe brake. Our machines are well-known and appreciated for its striking features like low maintenance, safe operations and long life. Having a definite quality management system, we are engaged in manufacturing, exporting and supplying optimum quality Semi Automatic Paper Cutting Machine. The immaculate gamut of Semi Automatic Paper Cutting Machines offered by us is widely appreciated by the clients all over India. Manufactured using high grade raw materials, these machines are used to enhance production capacity and speed. These machines are highly in demand in the market and can be availed at the most reasonable prices.